"I want my tooth pulled. How bad does it hurt, or does it?!" There are a lot of reasons why a tooth needs to be pulled (or extracted). Before going into all the reasons why a tooth needs to be pulled, you need to know that I am good at pulling teeth. I am also FAST. That means you spend less time in the chair getting that tooth removed. I can get most teeth out in 5 mins or less, the rare exception is a tough wisdom tooth or a molar that is already broken down. Even then I get most teeth out quickly. I also always makes sure you are numb, and if you want the laughing gas we have it ready. If you need a tooth pulled, you need to call my office. You won't regret it. I pull teeth on patients from all over. See the last paragraph for info on how to save money if you don't have dental insurance and you need a tooth pulled. The most common reason is the tooth is broken down to the point that it won't last very long even if a root canal is completed. Just the other day I saw a gentleman that had a tooth that needed a crown. He was told he needed a crown a few years ago, but for various reasons he decided he would wait to fix the tooth. Now the tooth has cracked some and the cavity in the tooth has reached the nerve. He was hoping we could just crown it and the pain would go away. I told him to save the tooth would now require a root canal, and even if we did do a root canal there may not be enough tooth to hold the crown anyway. He was very disappointed and continued to ask me to find a way "save his tooth". Unfortunately the tooth was just too far gone, we had to pull it. Another common reason teeth need to be extracted is because they have a crack that has grown down one of the roots. Cracks in teeth are not uncommon. Many teeth live with cracks without any symptoms of problems. What matters is the crack location, and the direction it is growing. If the cracks grows down to the root surface the tooth is a goner. It will have to be pulled. If the crack grows into the nerve the tooth will certainly need a root canal, unless the crack has grown through the nerve and into the roots. In that case it will need to be extracted. Some people choose to pull their teeth for other reasons. It does cost a significant amount of money to save a tooth in trouble. Sometimes it is hard to justify the cost. 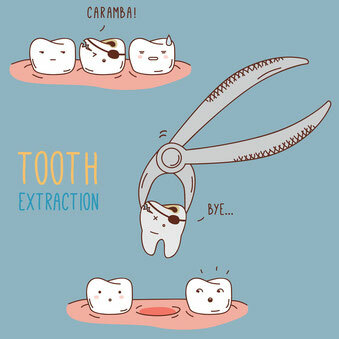 In that case we are fine extracting the tooth. Teeth can always be replaced down the road with a dental implant, but it usually costs more to do that than it would have to save the tooth in the first place. We currently have an extraction special for our patients that do not have dental insurance. for $199 we will pull any tooth, exam and X-rays are included in that $199. If it is a wisdom tooth we will pull it for $250, and that also includes the exam and X-rays. Click Current Specials if you would like to print off the certificate for this extraction deal.